Back in the good ol' territorial days when Mark Twain aptly described Utah as the Union's only theocracy, Salt Lake City residents had a different idea of what finding the spirit was about—and for the Gentiles, the spirit was to be found in a nice brown bottle at one of the taverns along this very stretch of Main Street where Whiskey Street Bar now proudly celebrates its rebel heritage. 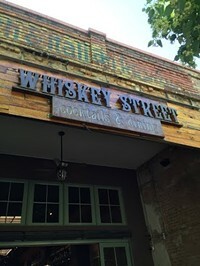 It's a bar-straddling history: Whiskey Street has speakeasy class and style and also a modern selection of drinks and food items. The downtown Salt Lake City bar has a stellar selection of spirits and liquors are the perfect match to a menu that defies the "bar food" classification. Appetizers include inspired snacks like braised pork-belly corn dogs, and entrees ranging from seared halibut to rosemary lamb chops with mint pesto sauce.